Despite the general increase in online sales, recent research by leading brand Van Vault has highlighted that tradespeople still prefer more traditional methods of buying equipment. Stiebel Eltron has announced a range of innovative new products across its hot water, heating and ventilation divisions following a successful showing at ISH 2019. Hudson contract monthly pay data reveals earnings bounce back to average of â£1,124 a week during February. An independent study, done by the iNNiTi, to enhance the evidence base for hydrogen technology has paved the way for its feasibility as a future clean energy source in the Humber region. GDPR and Brexit both seem to be all anyone has talked about over the past few years. Yet no one seems to be any clearer on these topics. With domestic burglary on the rise by more than 30%, a basic security routine needs to be introduced says the GBC Group. Van leasing specialists LeaseVan have urged UK drivers to steer clear of danger when stopping to top up their vehicles. With the number of potholes set to rise over the next three months experts from van leasing giant Leasevan have revealed the shock costs British van drivers could face. Britain’s four million van drivers have been warned of the serious health risks they face from sitting behind the wheel every day. 52% of UK trades workers would be more productive if offered gamified rewards! 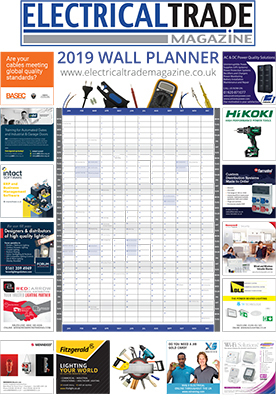 Electrical Trade Magazine is delighted to announce a brand new competition for electricians supporting fire safety at home and work. A new competition is on the lookout for deserving tradesmen to win their ultimate lunchtime treat, delivered straight to them on the job. Whitstable developer George Wilson has won a trip to Las Vegas after entering a competition with electrical wholesaler Electricbase. SkillELECTRIC organiser NET is calling on electrical business owners and managers to put their best young electricians forward for the 2017 competition. Solar power is currently installed in 850,000 homes in the UK, and interest is growing as consumers look for ways to alleviate the ever growing pressure on their wallets, and the Government strives to meet challenging emissions targets. Read more about Solar power is the way forward or didn't you know? Signify (Euronext: LIGHT), the world leader in lighting, has installed its connected lighting system Interact Sports at the Toyota Stadium in Aichi, Japan. A ground breaking animation showing the journey in becoming a fully qualified electrician has been developed in partnership between SELECT and the Scottish Joint Industry Board (SJIB). New data from all England and Wales fire and rescue services, the National Fire Survey 2019, has revealed that Greater London had the most fires in factories and warehouses at 180 from April 2015 to October 2018.